Roundwood woman Maura Doyle, who was dug out by troops from the 7th Infantry bn Lt Richard O’Hagan, Cpl Wayne Casey, Pte Mick McCabe, Pte Gareth Callaghan, and Pte Paul Keane, who called back with a cake and card to celebrate her 100th birthday the next day. 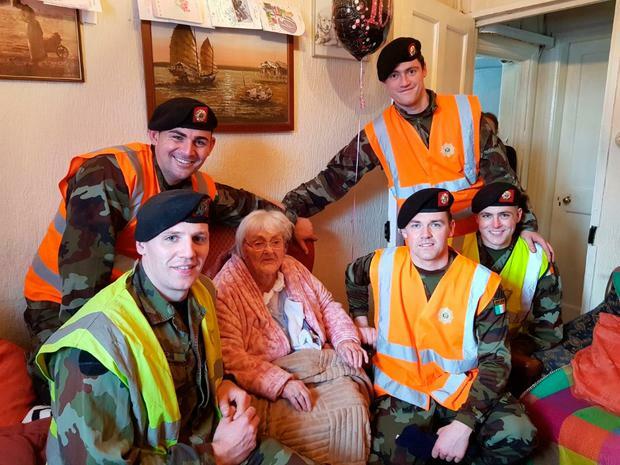 A STRANDED woman spent her 100th birthday with members of Defence Force - a day after they were called out to clear the road to her home so carers could gain access. Following the chaos caused by Storm Emma, Wicklow woman, Maura Doyle was snowed-in and needed assistance on Tuesday. Having been clearing snow and ice in the Roundwood area, troops from the 7th Infantry battalion were then tasked with clearing the approach to Ms Doyle's home nearby. When they were finished, and met Ms Doyle, she informed the troops that she was to reach a century the following day. "It was great to have the opportunity to meet Ms Doyle on the eve of her 100th birthday. As we were working in the same area the following day we decided we would call back with a card and a cake to help her celebrate the big occasion," Lt Richard O'Hagan said. Her son, Eugene thanked the Defence Forces for their efforts on Tuesday. "To return the day after for her birthday was great," he said. So far during the snow and ice, the Defence Forces have deployed 2,496 personnel and 767 vehicles to provide round-the-clock support to civil authorities and the emergency services.